An exclusively designed stainless steel booster grid acts as a catalyst to create complete combustion to increase the intensity of the fire and the brilliant glow of the logs. Two burner systems (18/20 and 24/30) with controls hidden under the burner in a compact footprint to fit most wood-burning fireplaces with a large gas log set. The G31 Real Fyre Charred Evergreen Oak Vented Gas Logs with an On/Off Electronic Pilot Kit are a beautiful choice for upgrading from a wood burning fireplace. Featuring realistic bark detail and glowing like real burning logs, these logs easily capture the look and feel of a wood fire while having the convenience of a modern gas fireplace. 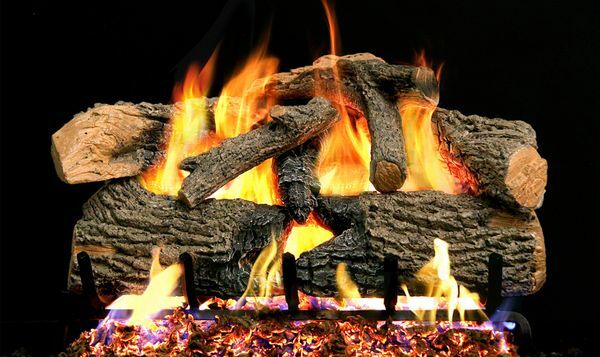 These logs have hand painted surface details for the most realism, and the bottom log is charred and burnt through to provide a better view of the embers and flame. Logs are made of high-quality refractory ceramics, reinforced with steel rods for added integrity, maximum reinforcement, and breakage prevention. This set of logs does not come with a burner system, but one can be purchased to complete the set. The burner system uses fewer BTU's while retaining a higher, robust fire with dancing flames, and an exclusively designed stainless steel booster grid acts as a catalyst to create complete combustion to increase the intensity of the fire and the brilliant glow of the logs. The max BTU rating is 46,000 BTUs. Please Note: The fireplace's Middle Width must be at least 23 Inches and the Depth must be at least 15 Inches for this gas log set to fit. You can calculate the middle width of your firebox by measuring the width (left to right) approximately half way back in the firebox. If you have any questions, please contact our customer service department and we will be happy to assist you in finding the perfect size gas log set.